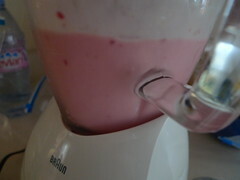 Dump the yogurt, frozen mixed fruit and sugar into a blender. Pour the water into the blender, enough to cover the other ingredients completely. Then blend on HIGH for 10 seconds. Done. Makes four servings. Because of the chicken wings, we purposefully make our smoothies a bit more liquidy. You may prefer to have yours thicker, and that’s cool. Experiment! Swap out the mixed fruit for other frozen fruit, or add some veggies for even MORE nutritious hunger zapping power! We use Chobani greek yogurt because it packs one heck of a protein and calcium wallop – 22g and 25% DV, respectively. And it has all those active and live cultures everyone raves about. Do you have any quick and easy go-to breakfasts for busy mornings? Let me know, leave a comment below! Looks tasty! Smoothies are such an easy way to get nutrients into your bod first thing in the AM. Love the creativity! Thanks! I’m starting to experiment with greek yogurt more; I recently found a guide about substituting Chobani for other items while cooking (found here) that I can’t wait to try! Love it! We have taken to making smoothies every morning, too! We use one flavored fat free yogurt (i love Greek yogurt but the price gives me heart burn at the rate we eat it), frozen fruit, protein powder (maybe when this runs out I’ll switch to Greek instead) and orange juice. Smoothies rock for breakfast on the go! I almost spit my coffee out LOLing at “I love Greek yogurt but the prices give me heartburn…”! Thanks for the laugh.